(Implanters job) Microchip Fred using an ISO chip. Complete all the paper work and make sure it is submitted to the Petrac register. Discuss the other requirements with the owner about the lengthy process to follow. Not all microchips are ISO compliant so may not be read using the ISO scanners at the ports and airports. The Avid chips are ISO approved and are the most reliable and dependable on the market. Combined with its price and history of not migrating it is an act hard to beat! Fred is vaccinated against rabies at the local veterinary practice - he must be at least 3 months old and depending on the vaccine used, Fred may need a second dose one month later. developed sufficient immunity. The results may take 3 weeks to be returned. Very few animals fail this test but if they do they must be re vaccinated and sampled again. Once Fred has past the blood test he can now get his Pet Passport! But he cannot use it yet! Since the scheme operates across the whole of Europe , where rabies is endemic; a sixth month delay is enforced in the uk. In effect he has to spend a period of quarantine with his owner in the UK (as would a French or Spanish dog). In essence, you can take your animal out of the UK before this period has elapsed, but you cannot return until the 6 months have elapsed. 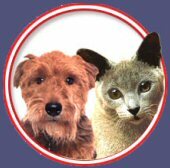 • Mrs Smith may need an export certificate to take Fred into some countries as the PET Passport. Mrs Smith will need to contact DEFRA, (number below) to check what is needed and how it is to be organised. The DEFRA Export department is efficient and has all the latest information. As a rule it is easy to take animals to Europe and gets more difficult as you get further a field. • Some countries have other requirements so it is also sensible to contact the embassy for the countries involved and check with them. • If Mrs Smith intends to travel through several countries she may need several export certificates! Do NOT Panic though - the system works well and DEFRA will sort out what is needed.